Why do mountain grapes from high altitude vineyards produce better wines? 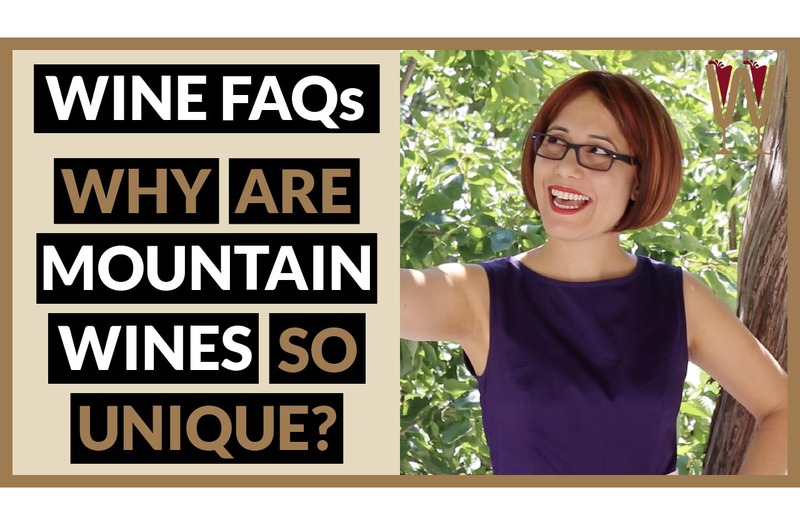 In this episode WineScribble explores the topic of mountain grapes and high altitude wines. There are three main reasons why mountain vineyards produce wines of such unique character. In typical WineScribble style, Annabelle takes us on a journey through the characters of mountain grapes with analogy to the characters of Rock Music. And stick around for the 50 Shades punchline! Why do high altitude vineyards produce better wines? Today I am standing in the backyard of the stone cottage I am renting in the village of Platres, halfway up the Troodos mountains, on the island of Cyprus. My altitude is currently 1200 metres and I am surrounded by vineyards on every mountain slope. So, naturally I have caught myself wondering: why do high-altitude, mountainside vineyards so often produce better wine than vineyards on flat ground? So, why do vineyards that grow on the side of mountains seem to produce wine with so much more character? There are three reasons and they all point back to one fundamental principle that drives matters of the heart: Treat Them Mean, Keep Them Keen. First of all, the grapes produced in a mountainside vineyard have to get used to being played hot and cold. No matter how blisteringly hot a summer day has been, come nightfall, the temperature on the mountains plummets. This daily switch between hot and cold temperatures slows down the rate at which the grapes ripen and hinders the sugar production. And is this a good thing? For wine, yes! Absolutely. A vine growing in a stable valley vineyard grows in a toasty-warm environment, ripening steadily both night and day. The alternate hot and cold spells of a mountainside, on the other hand, produce grapes that have adequate levels of sugar to be flavoursome but also tons of acidity for a bit of an edge. It’s the difference between dating Chris Martin or Lenny Kravitz. Lenny, if you are watching, I have left my phone number in the Description below! Mountain Grapes do not wear Sunscreen! There is another reason why mountain vines have an edge over their valley counterparts. The higher up you are the more intense the sun’s rays. In fact exposure to ultraviolet rays increases by 10% for every 1000 metres of elevation because the atmosphere is thinner and less able to absorb sun’s radiation. And what does that mean for mountain grapes? They receive more concentrated and intense sunlight which causes the pigments in their skin to develop a deep, dark colour but it also causes the grape skin to become thick and tough. In human terms, this would be a little bit like having to date Tom Jones. These tanned, weathered grapes produce wines of intensely vivid colour and muscular tannins, but, unlike Tom Jones, this intense UV exposure produces wines that age very well. Last but not least, a lofty vineyard site is a cruel Mistress. It is a dreadful place for any plant to thrive in. The soil is rocky and poor in nutrients, and rainfall drains away before plants have had a chance to absorb it. These are far from ideal conditions for most plants, but here’s the thing: grapes love it. Think of it as Fifty Shades of Grape, if you like. However, unlike vines grown in valleys that only need to leisurely rummage with their roots around the rich topsoil to get all the nutrition and water they need, mountain vines have to put in some serious work to survive. They divert energy from berry production to nutrient extraction, digging extraordinarily deep into the rocky soil, and their berries are low in number and small in size. But like any rags-to-riches story, each of these little berry survivors hides within it a ton of strength, intensity and character. In human terms, a good example would be…any rock star you care to name, except Chris Martin. To sum up, there are three points of contrast between vines that grow on mountain slopes and vines that grow on valley floors. Mountain grapes suffer through temperature shifts between day and night, are exposed to higher levels of ultraviolet rays and have to struggle to get nutrients and water. The result is a fruitiness balanced with bright acidity and unparalleled tannic structure. In wine, as in rock, too much comfort kills what could have been amazing. It’s the dreadful second album, after the money and critical acclaim have been pouring in. And the reason is simple. You cannot summon any rage against an evil empire whilst sipping margaritas by the pool of a 5-star hotel. Which leads me to my original point: The wine that will give you the greatest pleasure is the one that’s hard to get. If you like this video, please subscribe, like it and share it with your friends. And remember, Tasters: those who drink, get drunk. Those who taste, feel sublime. I will see you on the next video! VinePair: Why do wines from high-elevation taste so good? Jancis Robinson: The highest Vineyards in the World! Do not forget to subsccribe, show the video to the rest of the band, and email: anna@winescribble.com to say Hey!